CFR Table of Contents. Fast scrolling and indexed to quickly find the CFR Section you need. This screen can also be customized to contain only the CFR Parts you're interested in. Favorites. Choose default favorites for GA, Commercial, or AMT - or customize your own. 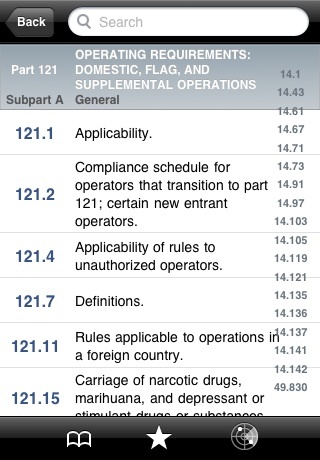 Whatever CFR Parts you select here will be displayed in the main CFR Table of Contents. CFR Section. 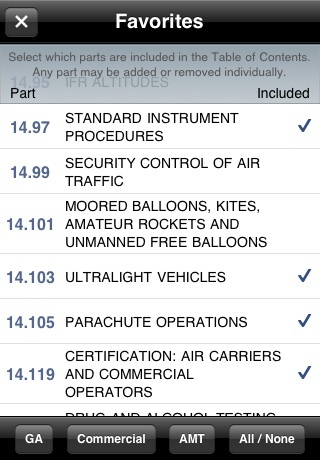 Tap a section entry in the CFR Table of Contents to view it. From here, move from entry to entry using the navigation buttons at the top of the screen. Bookmarks. Bookmarks are an easy way to categorize and quickly access any PilotFAR content. Send via Email. Are you an instructor? Send your students the sections or paragraphs they need to brush up on. Searching. Search for any word or term. 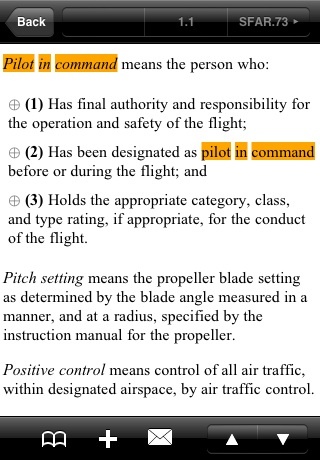 Be sure to put quotes around terms like "pilot in command". Search Results. The Table of Contents is filtered to include only topics that mached your search. Highlighted Search Terms. When you tap to view a search-result, your search term is highlighted and scrolled into view automatically. Use the navigation buttons to move to the next or previous search result. Themes. If you don't like the 'Blue Sky' default theme, you can change the color scheme to traditional iPhone Blue or Black. 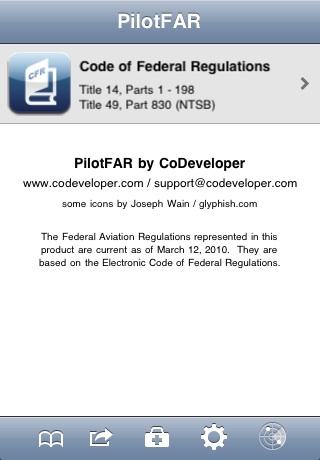 PilotFAR is the premier Code of Federal Regulations / Federal Aviation Regulations (CFR / FAR) app for the iPhone and iPod Touch. Now in its third major release, PilotFAR is highly refined and includes many features and ideas requested by our users. Lose the heavy book and fly with PilotFAR! Check out our plethora of reviews - they’re all from real pilots, students, and instructors who use our products every day. We’re pilots ourselves so we understand the type of products you want and need. 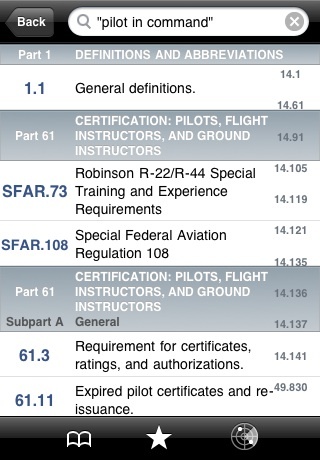 PilotFAR includes ALL of CFR Title 14, and also CFR Title 49, Part 830 (“NTSB 830”). 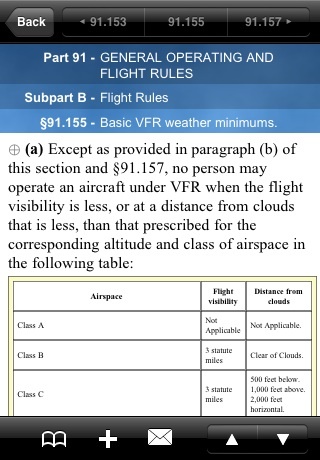 PilotFAR also includes applicable SFARs. 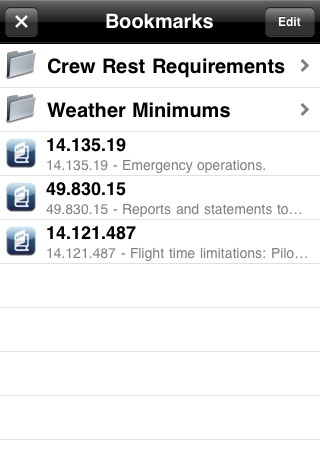 PilotFAR works without an internet connection - all content is installed on your iPhone or iPod Touch. 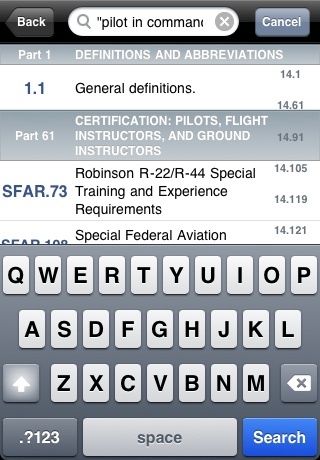 We update PilotFAR several times per year with the latest regulatory and FAA content - for free! There's no need to keep buying yearly upgrades or even to keep buying that thick heavy book you used to carry with you. All content is cross-referenced and hyperlinked. 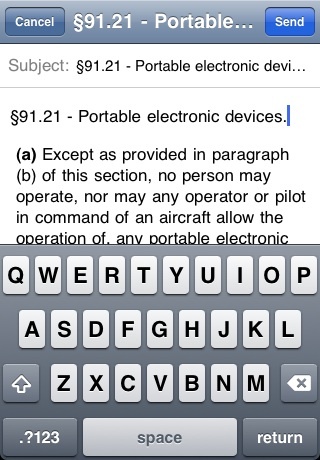 For example, if one regulation refers to another, just tap the hyperlink. PilotFAR includes all illustrations and tables associated with the content. Bookmarks Bookmark your frequently accessed CFR and AIM topics for quick access later. If you have a lot of bookmarks you can organize them into folders, just like in Mobile Safari. Email Others Are you a CFI? When a student needs to brush up on a regulation or AIM topic, send it to them - instantly. Integrated If you use our other products, such as PilotPrep, those products include hyperlinks directly into PilotFAR. Themes Don't like the default "blue-sky" look of the app? Change the color scheme to plain blue or black.